Nikahang Kowsar loves to make people laugh at the world’s problems, and he is deeply committed to doing so. As an Iranian-born and Canadian-based cartoonist now based in DC, Kowsar is the Editor in Chief at the citizen journalism platform Khodnevis, and founder of Toonistan, a social network for making and sharing cartoons. Kowsar understands all too well the power of cartoons; political cartoons can be deadly serious in many countries around the world. Kowsar was briefly detained in 2000 for drawing an Ayatollah as a crocodile choking a journalist, and was forced to flee Iran to Canada three years later due to death threats. Over two decades of experience in cartoons and the news industry has made Kowsar an invaluable resource for understanding the role of media, humor, and law in politics around the world. We were very drawn to his longstanding belief that humor and citizen media can change the world. We are honored to get him on the phone and talk about Toonistan and all of his work. Q: I read that you studied geology and started making comics of your professors. What drew you to start making comics professionally? A: I actually started drawing cartoons when I was in elementary school. My dad always used to buy Time Magazine or Newsweek and I loved the cartoons. I loved to see what they might have published by Pat Oliphant and other cartoonists. After the Islamic Revolution of 1979, there were a lot of comic magazines published that were denouncing the Shah’s regime and were pro-revolution and I used to copy those cartoons as well. I stopped that in 5th grade, and started up and stopped again in high school. But when I was in college studying geology, I didn’t want to leave it this time and I wanted it to be a little more serious. I had a collection of David Levine’s caricatures, and so when I started drawing my professors, I used his techniques and experiences on my professors and also at different geology conferences in Iran. This gradually brought a new name to me at the conferences where they knew me as “The Cartoonist.” The funny thing is that after a few months I got a call from one of the major satirical comic magazines called Gol-Agha. It was the number one magazine at that time in Iran and they wanted to hire me. So that was big news for me as a geology student just finishing college. That was in 1991. In 1993, I joined mainstream media, working for one of Iran’s major national newspapers, Hamshahri. I used to do stories, photography, writing articles, anything you could think of for the newspaper, even though I was known for just being a cartoonist at that time. For me, it became also about introducing cartoons to the Iranian public so I started writing articles and essays about cartoons as well. Q: Out of all the tools that can be used to fight against tyranny, why are comics and humor so important to you? A: I’m sure you’ve heard the saying a billion times, that a picture is worth a thousand words. Well, I believe that a good cartoon is worth a million. The importance of a cartoon is that it’s not just a picture. It has humor and some spice added to it that makes it actually resonate in the mind and your memory for ages. I can still remember a cartoon about Coca-Cola in China in the 70s [Editor’s note: Unfortunately, Kowsar couldn’t find the original cartoon]. I think it was because the cartoon was able to showcase the contradiction and paradox in a funny and witty way that was understood in a blink. How could China have fought against “Imperialism” drinking one of its products that actually represented what China was against? It was memorable. I remember cartoons when I was in elementary school during the revolution. I think that the impact of political cartoons on society has proven that you can actually change the mindset of individuals who are concerned. Like in the 19th century when Honoré Daumier, the French artist and cartoonist, changed the public’s perception of the government. Or how Thomas Nast changed politics in the 19th century. I’ve been deeply influenced by their work. Q: So as an established cartoonist with a distinct style, how have you gone about enabling others to become their own unique cartoonists with Toonistan? A: People can create cartoons and with social networking we were thinking about how could we use our experiences as cartoonists and give something to the people so they could create their own cartoons. But this is just a trial, we are still trying to enhance Toonistan. We have been creating a group of Iranian characters plus a group of international characters and we are trying to learn from users as well. Basically people on the web are often consumers; we want to make consumers creative producers. That’s a real challenge with the Iranian community and on Facebook and other social networks. Contributing is not something that many people are in love with. So we are trying to make something that can make that just a little bit easier, especially for people who cannot draw but are interested in cartoons. People relate to artists for the unique ways they make characters. But that wasn’t really possible. We are trying to find out which characters are more geared to people. 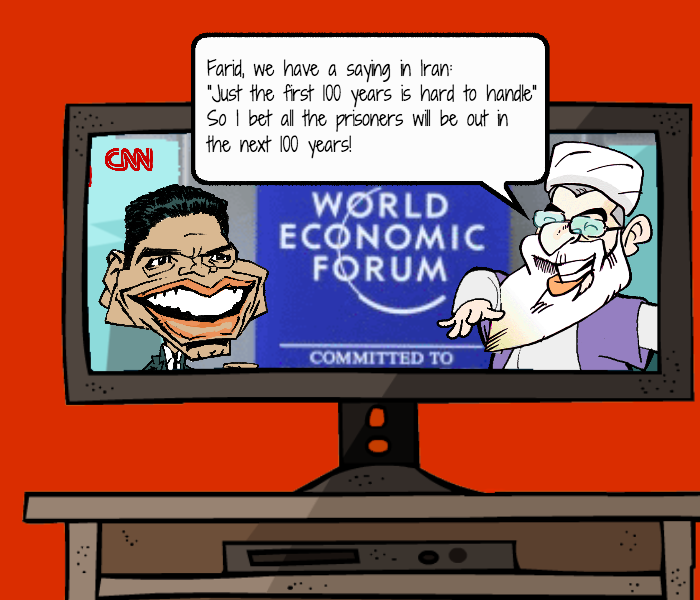 For instance, we had a cartoon about one of Iran’s big soccer players. He was retiring, but wasn’t invited to join the national team going to the 2014 World Cup. Despite making the decision to retire, he wasn’t sure if he was going to be invited to his own goodbye game. One member used his character and made fun of the coach. So it’s not just politics. We cover sports, media, and cinema. It can be about anything important to audiences inside and outside Iran. I’m not the only cartoonist working on characters for Toonistan. My other friends are artists and help me with this. One of my colleagues, who is a well known caricature artist and animator living in Vancouver, has done a lot of these characters as well. We also have a lot of characters from Iranian artists, but they can’t be named for security reasons. 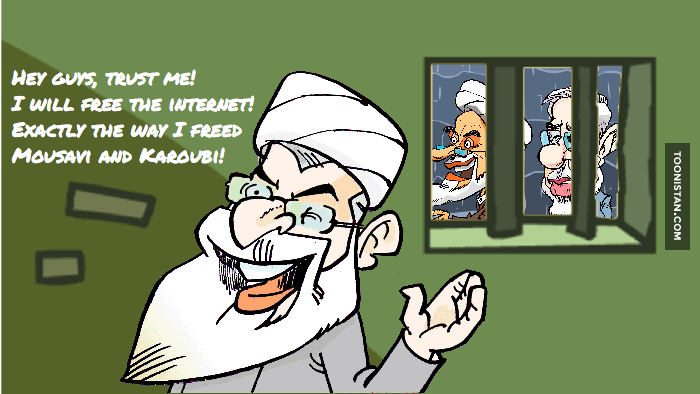 Because if the Iranian government found out they had drawn the Ayatollah or people in a funny way they will be in trouble. Q: You say that Toonistan is blocked in Iran, so what is the audience for Toonistan right now? A: I assume most of the viewers are based in Iran, but it’s hard to find out. If we want to just watch the IP addresses we can see which proxies they are using, like say Psiphon, to enter the site. I wish we could build something where people could create their cartoon on Facebook or another platform where anything about them wouldn’t be that hard to find. I know Facebook is blocked in Iran but you will see that many people are still on it inside the country. It seems that there is more of a demand for Facebook so maybe it could be a good portal for us, but we have to think about it. Q: Tell us about the risks involved for Iranians making political cartoons or participating in Toonistan today? A: You actually cannot draw whatever you want in Iran. It’s not like in the United States or Canada where you can be an obedient citizen and draw cartoons of politicians without actually drawing anything with hatred or hate language. You know your limits and you’re free to express your own ideas. In Iran, sometimes you don’t know your limits and you cannot see them. One day a cartoon can be acknowledged and loved by the politicians and the next day you might go to prison for just making the slightest joke. You cannot joke about and draw the Ayatollahs. The problem is that the Ayatollahs are in power. You cannot make jokes about the military forces, the police, the intelligence community, religion, or certain parts of the regime. There are limits. If you want to push the red lines, and if they notice you are pushing a little too much, you will be in trouble. We wanted to break some taboos in Iran. I tried to turn an Ayatollah into a crocodile and they know him by that name now. They called him Professor Crocodile. He is one of the most powerful people in the country, but the result is now I’m out of the country, far away from home, and I’ve suffered a lot. I don’t want other cartoonists or anyone to suffer for similar reasons. I know that if someone draws even a slightly satirical joke about an Ayatollah today they will be in much more trouble than I was in 2000 to 2003. During that period of time I was a client of Cartoonist Rights Network, and that really helped me get out of the country when I received a death threat. In 2006, a cartoonist was sent to prison for using an ethnic word, one that is used by everyone in the country. The group wanted to take advantage of it and he became a scapegoat and was arrested and received a lot of threats. 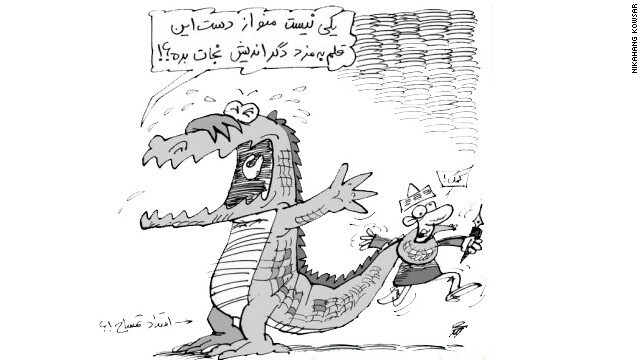 A year and a half ago another cartoonist was sentenced to 25 lashes for making fun of a former member of parliament. Things have not changed. They have gotten worse. People living in the West have not experienced the troubles that Iranian bloggers have. One Iranian blogger used his first name on his blog. Government officials found out who had done all the posts. He was arrested by the cyber police and tortured to death two years ago. We don’t want this to happen to anybody. Q: How does Toonistan seek to protect its users? A: We use the experience and knowledge of an anonymous group of geeks from the Balkans who have dealt with similar problems with activists who have wanted their own thoughts and websites and needed privacy. They have the experience and we use their help. One of the things that we always encourage people to do is avoid using their real names. We also ask them to avoid hate language as well. It’s not just a one-sided thing. They have to take responsibility. Members know that if they use hate language or hatred we do not publish those cartoons. We wanted to encourage people to take some things seriously, and we had to implement this step to help them avoid hatred. Q: So as the Editor in Chief at Khodnevis, what will the relationship between Toonistan and Khodnevis be? A: Khodnevis has become a serious news website. 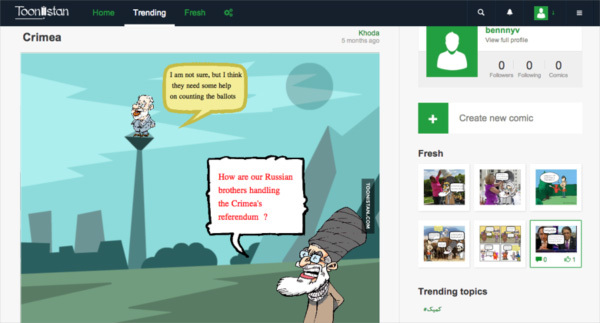 Although it is a citizen journalism platform, it is one of the major Iranian news outlets. 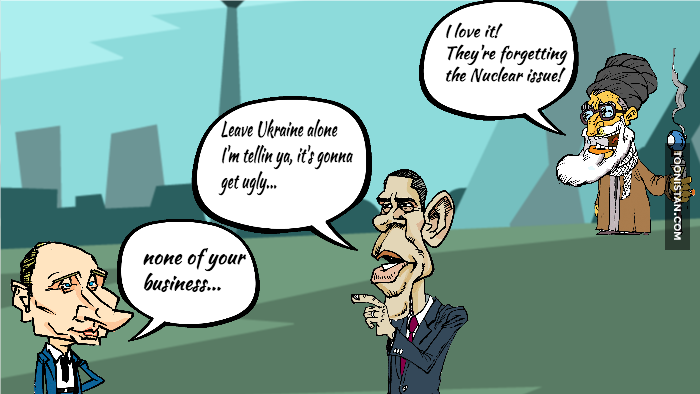 We have been able to publish a lot of cartoons created by members of Toonistan on Khodnevis. It could become a platform for them to reach larger audiences. We considered adding Toonistan as part of Khodnevis at the beginning but my friends thought that keeping Toonistan independent would help people be more comfortable with posting cartoons. There are a lot of pros and cons but that’s why we chose to keep Toonistan a little bit separate. One thing we are trying to do is find a sponsor to help us make Toonistan more usable to more audiences. I am still not satisfied with the speed of the platform; it can be a little slow for creating cartoons especially if you have dial-up internet. So we have to do more work to make it open to more people with lower bandwidth. If you add, say, ten characters in a frame it becomes slower and we need to figure out how to change this. If someone makes these cartoons but cannot save it because their internet is too slow that would be a minus for us. We have to make this work here for Iranian audiences and if we can do that it could be a great experience for non-Iranian audiences as well. Say if people in South Africa want to make fun of Jacob Zuma for all of his anti-condom policies. [Editor’s note: Zuma is quoted as saying he believed showering would reduce the risk of contracting HIV]. So I could use my good friend’s Shapiro’s cartoon characters who has made hundreds of cartoons about the president already. If we are successful and could find interested people in other communities, Toonistan could become something that many other people could use. So one of the thoughts was enhancing it and making it open source so that others can actually use it. That is our final goal. Q: In terms of social impact, what’s your ideal outcome for Toonistan? A: I would love to see younger children and women make their own cartoons as well as seeing school newspapers use this technique to give more color and spice to their content. I’d love to see more cartoons against tyrants in totalitarian ruled countries and get to the point when every citizen feels comfortable with making cartoons about anything. Nikahang Kowsar is an Iranian comic and blogger living in Canada. Kowsar is Editor in Chief at the citizen journalism platform Khodnevis, and in 2014 he launched Toonistan, a social network for making and sharing cartoons. Kowsar serves as a board member of Cartoonists Rights Network International and has worked as a journalist and cartoonist since 1991. Meme spirit animal: Crocodile-Doberman – I have called myself The Crocodile Dundee so I have to choose another animal 🙂 How about a Doberman? Or a Scorpion?